Last month I shared the World's Largest Coffee Table that I did for my Aunt Leann. When we dropped the new table off, Leann was super awesome and offered her old coffee table to me. She has great taste. 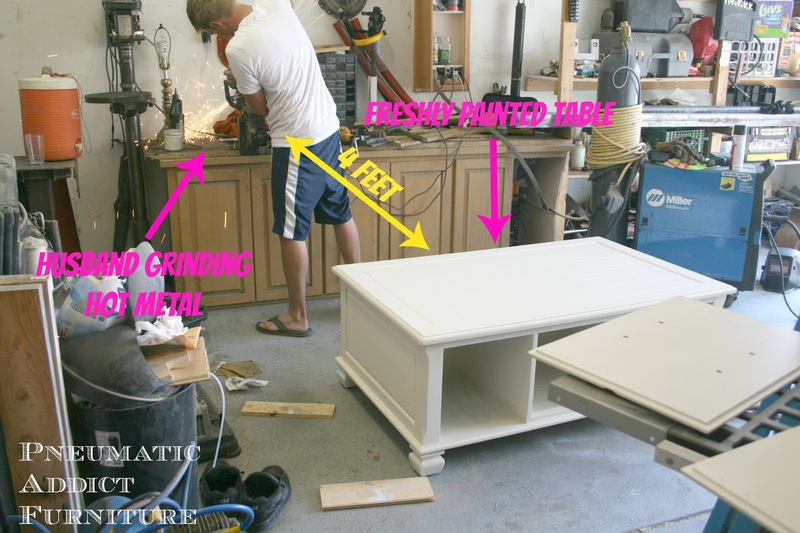 This table was constructed from hardwood and even had ball casters under the feet. The table was beautiful originally, but it was used to store toys and had seen some serious wear and tear from the grand kids. Besides the scratches and dings, one of the baskets was crushed and held together with packing tape. Obviously, I was going to have to come up with replacements. I could have sworn that I had photos of the steps but when I looked for them, they were nowhere to be found. I did find this photo documenting why we need a larger garage. So here is the after. I had a LOT of trouble with this one! I knew the orange-ish wood was going to have some serious tannin bleeding, so I started with 2 coats of Zinsser Cover-Stain, oil-based primer. I have never had this stuff not work... till now. Some of the scratches had previously been covered with a furniture touch-up pen. Apparently, that stuff will NEVER cover! I tried 3 more coats of a different, stain-covering primer and I still had red streaks bleeding through. Arg!!! After desperation, I decided to think outside the box and I found a solution! Clear nail polish. It's not a practical solution for a whole piece, but it worked like a champ for sealing the furniture touch-up pen. I just made sure to brush a very thin coat over the entire offending area, let it dry, and sprayed 2 coats of cottage-white, latex paint. I then brushed on 3 coats of PAS to seal everything. I chose not to glaze or distress this one. The details of the table were so pretty, I didn't want to take away from the classic lines. So what do you think? Check it out under the shop tab. What a beautiful beautiful transformation!!!!!!! Love the crate drawers with the rope pulls - just perfect! LOVE the pallet baskets with the rope pulls!! It looks AMAZING! Very good to know about the nail polish. Ummm, I LOVE LOVE the crates! 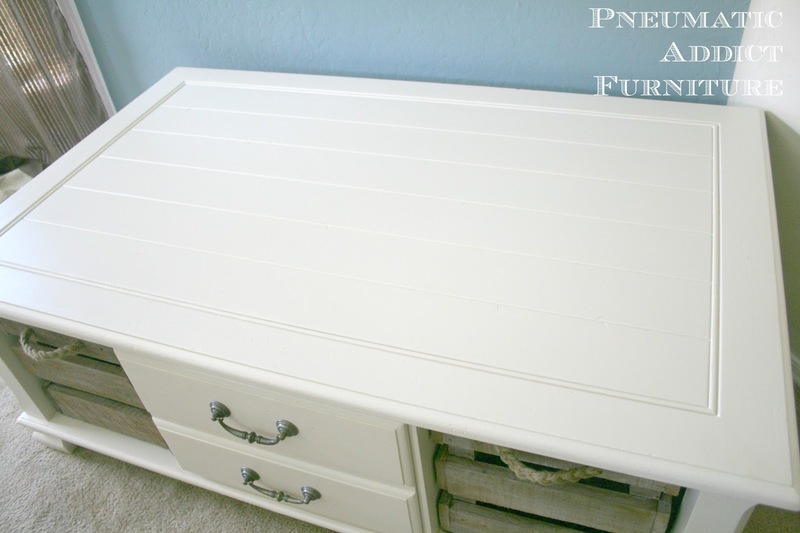 Totally makes the piece, and braided rope handles...CUTE! It's gorgeous!! Love the tip about the nail polish, too. Thanks for linking up to Give Me the Goods! Elisha I LOVE everything you have done. You are super creative!!!! I will be copying some of your projects !!!!! Everything you did to this piece is lovely. 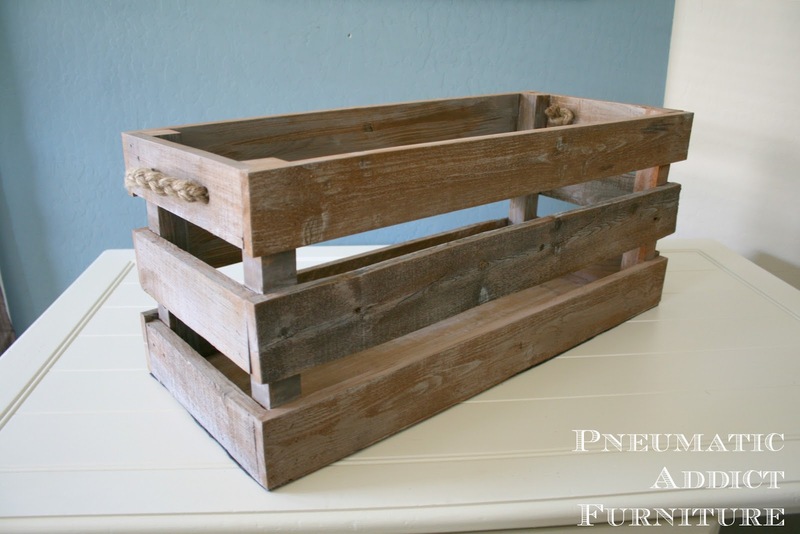 I love the pallet baskets, and what a way to figure out how to fix the problem areas. Love how it turned out. 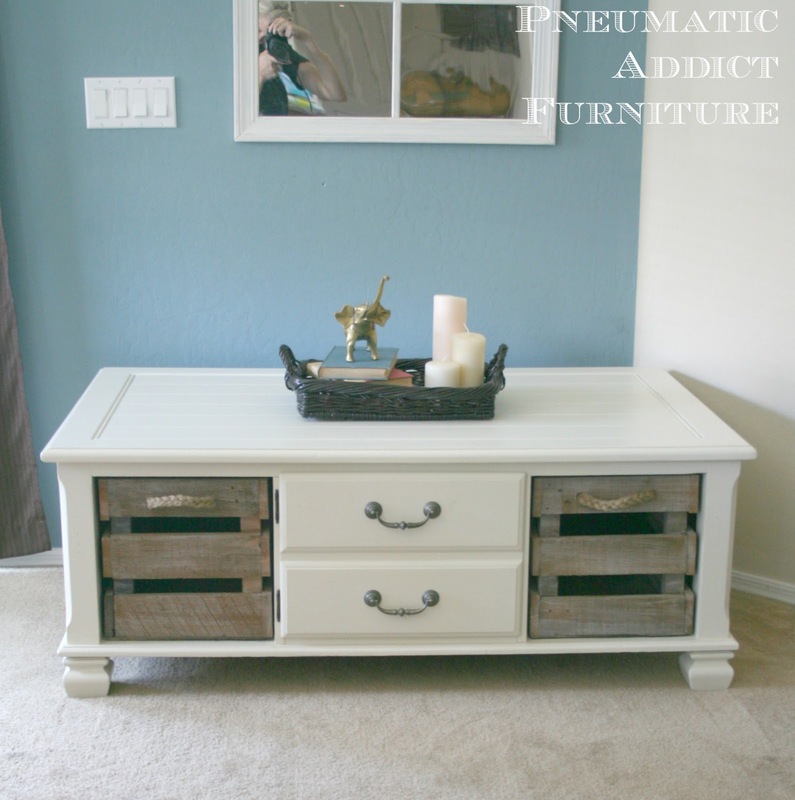 The crates add a great rustic/country touch and the white really transforms it. Love it! WOW,I love this transformation! 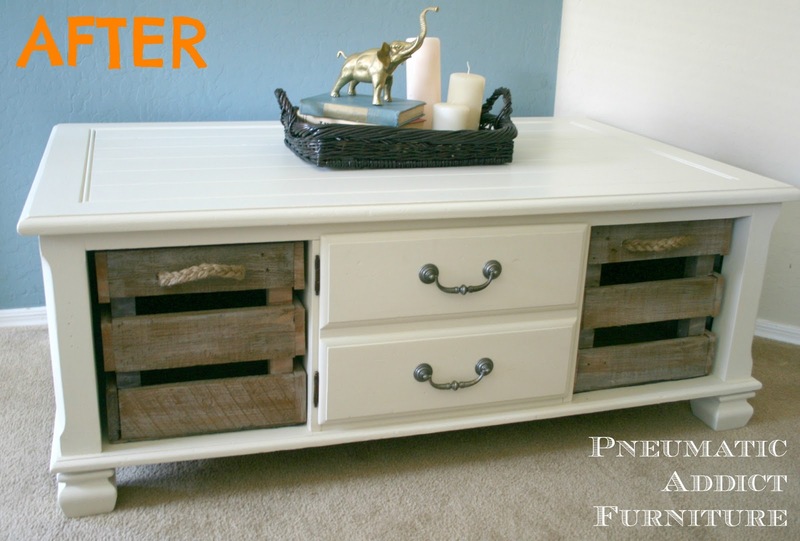 This table is so beautiful and I LOVE the crates instead of the baskets! This looks great! What a great paint job too, looks flawless! I just found your blog today and I'm a new follower. I hope you can visit my blog if you get a chance. This is AWESOME!!! Deff Pin Worthy!!! Thanks for sharing on DIY Sunday Showcase!! WOW I love this, the boxes are amazing!!!!! I would love for you to come link up at my paint party going on now! Elisha, this is GORGEOUS! What an amazing transformation. I absolutely love the crates that you used in there... such a great touch! Nice job Elisha. It looks so fresh in white. I love the crate baskets! Great tip about the nail polish. Thank you for sharing it at What We Accomplished Wednesdays. Have a great week! Looks great...love the addition of the pallet crates with the painted wood! AMAZING! Love this! I would love for you to share and link up at my weekly TGIF Link Party if you haven't already this week. Your favorite posts, most popular, recent or new! The party is open every Thursday night and closes Wednesday's at midnight. Followed by (Not SO) Wordless Wednesday! http://apeekintomyparadise.blogspot.com/. Beautiful transformation. 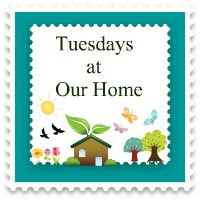 I'd love it if you would link up to my new and improved link party that is going on now. 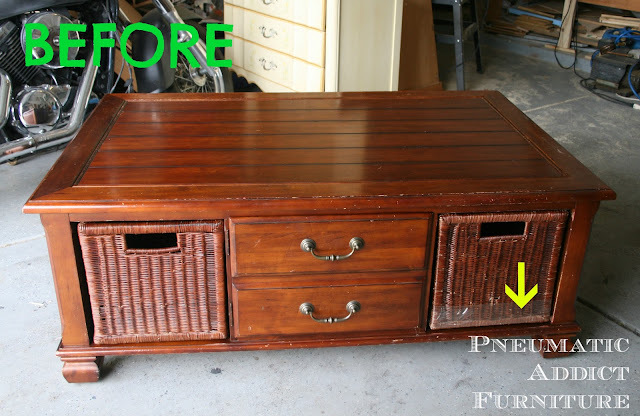 What a great transformation, love the crate baskets...so cool! Thanks so much for sharing at Amaze Me Monday!!! 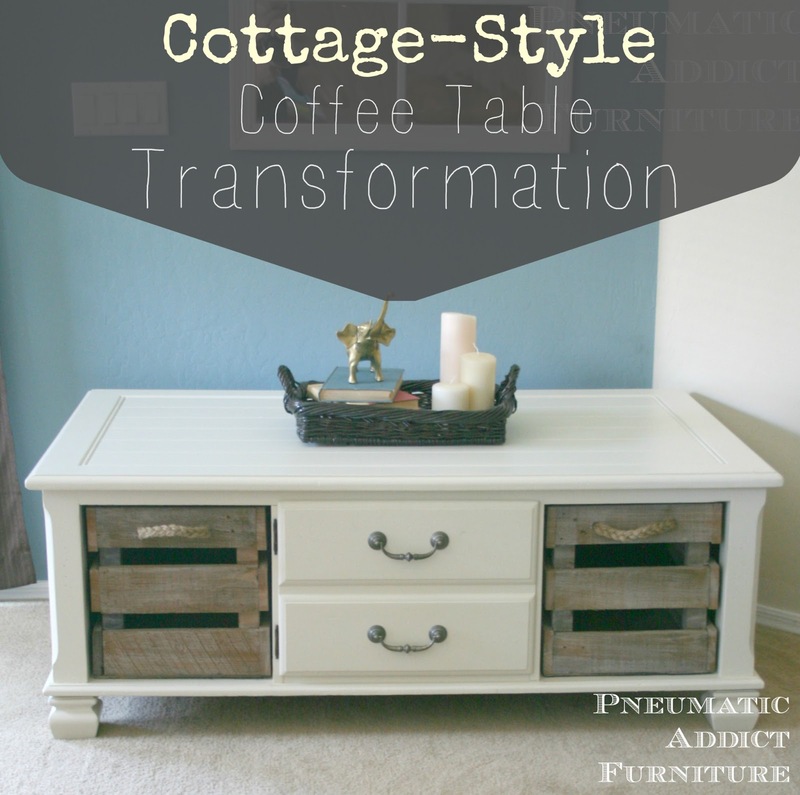 Love what you did with the coffee table and how your invented new storage pieces. 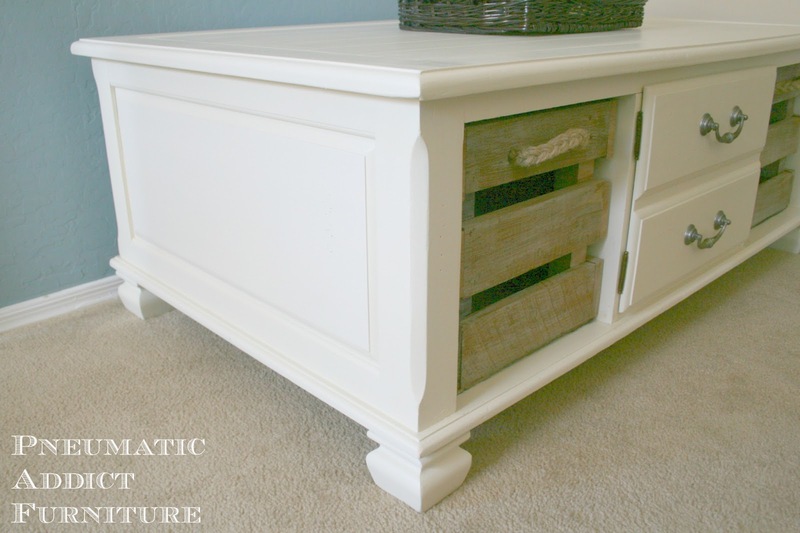 I love white coffee tables. Thank you for linking up to my Paint Party! I am featuring you on Thursday!!! Come over and Check it out!! Elisha! This is gorgeous and innovative....I love what you did! It was wonderful meeting you at Haven. 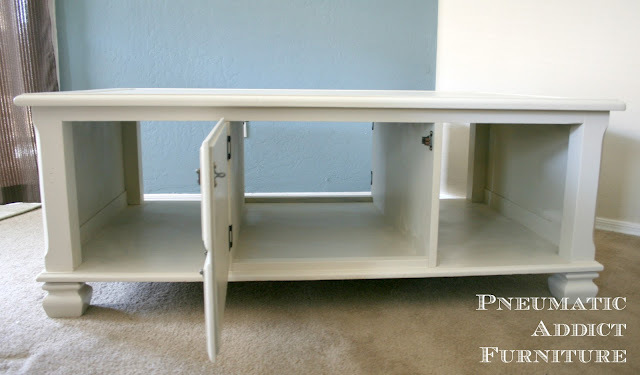 I have this EXACT table and have been wondering how to replace the baskets, thank you! Amazing transformation! I saw this exact table (and two end tables) at the thrift store today. Debating hard if I should get it. Even for toy storage alone! It is very beat up though too.